Progressive politics is clearly on a roll in Canada. In fact, some pundits say it has already “run the table,” and question whether it has run out of new places to go. That is a matter for those who scan the political heavens to decide. Here on earth, New Democrats are going to Edmonton this weekend for their federal convention. The Liberals, meanwhile, are bound for their biennial national convention in Winnipeg at the end of May. (Might federal Conservatives, who dropped the term Progressive from their name when it became unfashionable a decade ago, ponder renewing old nomenclature at their May convention in Vancouver?) Conventionally, party conventions were idea factories for future elections. Partisans with need to debate the proper placement of semi-colons in the fourth clause of the policy paper on this year’s obscure obsession jawed at hospitality suites with pragmatists who understood most of politics is written in disappearing ink. Effective pursuit of power emerged. But as Susan Delacourt and others have effectively argued, modern political parties are now little more than election machines shopping for votes. Prime Minister Trudeau’s announcement that the Liberals will dispense with paid memberships validates the point. What are the privileges of membership that has no price? Over the past decade in Canada, political networking conferences have supplanted party conventions as the place for idea incubation and development. The conservative Manning Centre long ago outgrew the basement of the Ottawa hotel where it was first held, and now takes over the city’s convention centre for three days of networking each spring. New Democrats at the Broadbent Institute and Liberals at Canada2020 played quick catch up. They now have their own well-established think tank events, both of which were coincidently held in late March this year. If the pulse of conservatism taken at the recent Manning conference was found to be very healthy despite October’s election debacle, left-wingers at Broadbent and left-centrists at Canada 2020 seemed to need deep breathing to keep their giddiness from gliding off the scale. Power regained can cause powerful euphoria. To their credit progressives clearly understand they will need some deep thinking to turn electoral gains into the long-term social change they seek. Five tensions appear evident and will need to be resolved if the current progressive roll is to continue. Redefining Responsible Government. 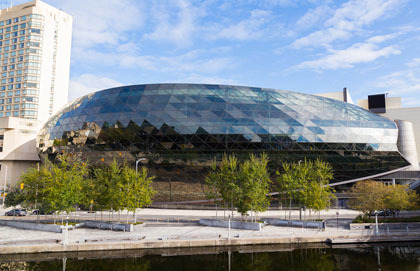 Open Government was the theme of the Canada2020 conference, and constitutes a base of the new progressive agenda. Few can dispute the good of measured transparency, data sharing, and advanced use of technology to engage citizens in public processes. But as one participant insightfully noted near the end of the conference, it is one thing to value openness as part of transparency and providing modern quality service to the citizenry. It is quite another to effectively manufacture “consultation processes” that involve the executive branch of government and the civil while functionally sidelining the legislature. Mostly ignored in the Canada 2020 conversation was the historic role elected members of Parliament have in providing a voice for constituents. In the preoccupation to ensure that every identifiable group and sub-constituency has a visible and identifiable voice, the role of the 338 elected representatives speaking for, and holding government to account on behalf of, all constituents is diminished. Open government for effective administration is one thing. Redefining democratic participation as a rough equivalent of retail customer satisfaction is quite another. Mistaking government spending for wealth creation. The recent federal budget can be used as Exhibit A for the presumption that government spending is the key for economic stimulus and growth. The term infrastructure is being legitimately used for spending on framework resources necessary for economic activity such as roads and power lines. It is also being used, erroneously, to justify payments to individuals that are really program spending. Indeed, even at the Broadbent conference, a politician from Vancouver – Vancouver! – warned against going too far in mixing bricks and concrete with day care centres under the heading of infrastructure. Labels matter. An important case can be made that infrastructure is social as well as physical. When the word is applied to almost everything, however, it becomes meaningless. The meaning lost is the critical relationship between government spending and economic growth. Government looks at the private sector and sees job creation. The private sector looks at itself and sees creation of goods and services, that is real wealth. Infrastructure, properly understood, is the bridge – sometimes literally – between the two. Reducing inequality’s inherent complexity. Linked closely to the discussion about government spending and its desired outcome of job creation is the desired outcome of less inequality and wealth distribution. While the “middle class” is a vague catch phrase designed to make us all feel included, the basic rules of arithmetic will catch up with us sooner or later. There is much energy spent on describing how the gap between the top and bottom of the income spectrum is a problem, with the test of almost every program being how “progressively” its benefits apply. But the outcomes of the economic formula depend not only on the percentage rate, but also on the number to which the percentage rate is applied. Focusing exclusively on the reduction of inequality without the context of market economics, which inevitably involves unequal outcomes has the unintended consequence of reducing of overall wealth production. Believing religion per se is the problem. References to aboriginal spirituality are common at progressive gatherings, though mostly as an expression of political respect and not religious identity. Yet it seems the political left has abandoned its religious roots. The social gospel strain that led to the formation of the forerunner parties to the NDP is conspicuous by its absence. There’s a nod to accommodation of worship. What’s forgotten is that religion involves more than worship. It brings an identity and worldview every bit as impactful on public life as sexuality does. Good and bad come with religion in the public square. The negatives and positives need to be understood and dealt with, not neglected with the blind hope that all religious belief will simply go away. The daily news provides proof it won’t. Nothing so powerful for the human spirit can simply be ignored or wished away. Real progress means accepting the reality of religious faith, not just tolerating its visible practices. Going beyond fashionable diversity labels. Yes, it is 2016, and few defend that politics crafted in backrooms by “old white guys” is ideal. But if diversity and identity politics become your hammer, than everything becomes a nail. A person is something more than a combination of gender, nationality or sexual identity. Progress has required overcoming blind spots about identity, and including those once marginalized. Yet it becomes counter-productive when new labels - “old, white guy,” “religious fanatic,” “sexual bigot,” simply replace the previous catalogue. Our humanity is reduced to the sum of our identified parts. Political dialogue is reduced to scorekeeping at an elementary field day: the game is only about no one getting hurt and everyone getting a participation ribbon.